One of the shows I look forward to every year is Queen’s Park – and I have been performing there now for 19 years. It’s a great job, and if the weather is nice then there is always a really big turnout. I estimated we had about 200 people watching the show last Friday. 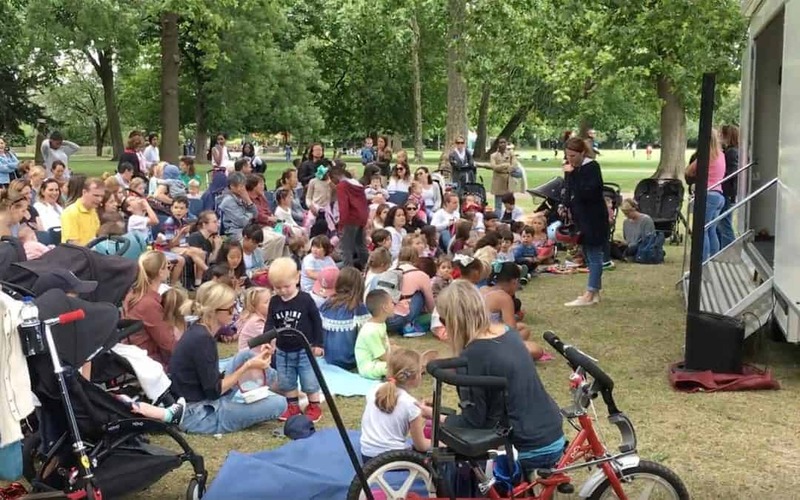 The City of London, who are responsible for booking these shows have a variety of acts that entertain every Wednesday, Friday and Sunday during the whole of August, starting at 3pm for an hour, right next to the children’s playground. Do come along to watch – you will have a lot of fun. I am back there on the 23rd August – see you there. Come and say hello, it would be great to meet you. I made a little video to show you how much fun it is. As a little extra bonus – see if you can see me in the photo at the top of this news item !! !